A doctor without health insurance? What could go wrong? “It’s probably nothing.” That’s what I said to myself not long ago when I started feeling lousy. I should know, since I’m a physician. But I learned the hard way that those “nothings” can get serious fast — and without health insurance, the bill can be astronomical. Just after Thanksgiving last year, it occurred to me that I was more tired than usual. I chalked it up to working a long string of shifts in the emergency department at the hospital. “I never get sick!” I told myself, and upped my caffeine intake. About a week later, I started spiking fevers, and my appetite dwindled. Something was wrong but I couldn’t put my finger on it. I convinced myself it was just a virus and would pass with time and rest. But I felt worse over the following week, not better. I continued to convince myself that it, whatever “it” was, would fade away on its own. I thought of the cost of a doctor’s visit, blood tests, imaging, and the rest, then took another Tylenol and went back to bed. You’re probably wondering why I didn’t simply see a doctor. I’m a bit reluctant to admit it, but I didn’t have health insurance. That’s right — I was a doctor without health insurance. Earlier in the fall, in the transition from one job to the next, my insurance had lapsed. When I was prompted to sign up for insurance with my new employer, I was told that it wouldn’t go into effect until open enrollment on Jan. 1. I didn’t question that. I was healthy. A few months without insurance would be fine. A colleague suggested I get covered under what’s commonly called COBRA. But I was flabbergasted by the cost, especially on top of student loan payments and living expenses. I then looked at Covered California, my state’s exchange for Affordable Care Act insurance plans, and was equally dismayed. Knowing my almost pristine health history, I opted to forgo insurance and instead pay the individual mandate penalty, which was a fraction of the cost of coverage. In other words, here I was talking myself out of going to the doctor — even though I was starting to lean in that direction — because I knew that a hospital bill without insurance would be more than I could handle. I’m not an anomaly. Many Americans do this every day. You can probably guess how my story unfolded. When I finally couldn’t put it off any longer, and was barely able to get out of bed, I ended up in the emergency department I work in. A colleague, looking at my chest X-ray showing extensive pneumonia, asked why I waited so long to see a doctor. In tears, I tried to explain. Later, hospital bill in hand, the explanation became easier. 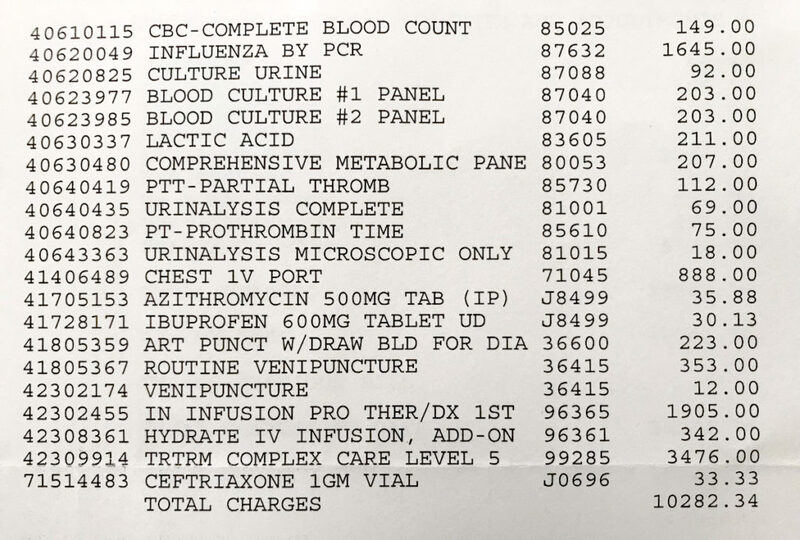 The bill for my emergency department visit totaled $10,282.34. I had asked that intravenous medications be changed to oral medications when possible because they are less expensive, and refused some additional tests and medications. This kind of insider information, which most people don’t have, helped me keep costs to a minimum — though I was shocked to see a $10,000 bill. Consider a single-income family in the U.S. I pick that category because about 1 in 4 children in our country are currently being raised by a single parent, and that number is rising. The average median income for a single-income family is about $35,000. If that parent or caregiver gets sick and needs medical care, how will she or he pay a bill that could be one-third or more of the family’s total annual income? That’s a powerful reason to wait. We talk about improving access to health care through health literacy, education, and outreach. These things matter. But until we address the cost of health care, a huge barrier to care will remain. Medicine is tightly intertwined with social factors, which affect both physicians and patients — and sometimes, both at the same time. Jessica K. Willett, M.D., is an emergency physician who works in Northern California.